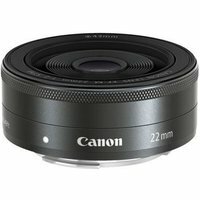 The Canon EF-M 22mm f2 STM lens is a pancake lens designed for use with the Canon EOS M compact system camera. This EF-M Mount lens is a great travel lens ideal for a wide range of subjects and offers a maximum f/2.0 aperture to ensure stills and movies can be captured handheld even in low light. Whether you're shooting landscapes or portraits, the Canon 22mm lens is a great all-around travel companion and features a minimum focusing distance of 0.15m. Focusing is smooth and quiet with Movie Servo AF, which uses STM stepping-motor technology, a great incentive for video enthusiasts looking to capture professional looking videos. This fast, pancake lens is extremely light and compact yet still provides you with the high-performance and image quality you would expect a Canon lens to produce. For use with the Canon EOS M and not suitable for DSLRs with Canon's EF or EF-S mounts.